Full Day Manila Tours, Excursions & Day Trips! A full-day guided tour of Manila brings you to the well-selected historical landmarks and interesting parts of the city. This tourliterally begins at the point from which all distances from Manila are measured: the monument of Dr. Jose P. Rizal. Then you explore Intramuros the "Walled City," which was the seat of Spain's 300-year colonial rule. From there, unfold the country's rich history as you stroll along a cobbled stone walk leading to the San Agustin Church. This is the oldest stone church in the Philippines and considered to be a UNESCO World Heritage Site. It has its own museum of religious and historical artifacts as well as priceless artworks. 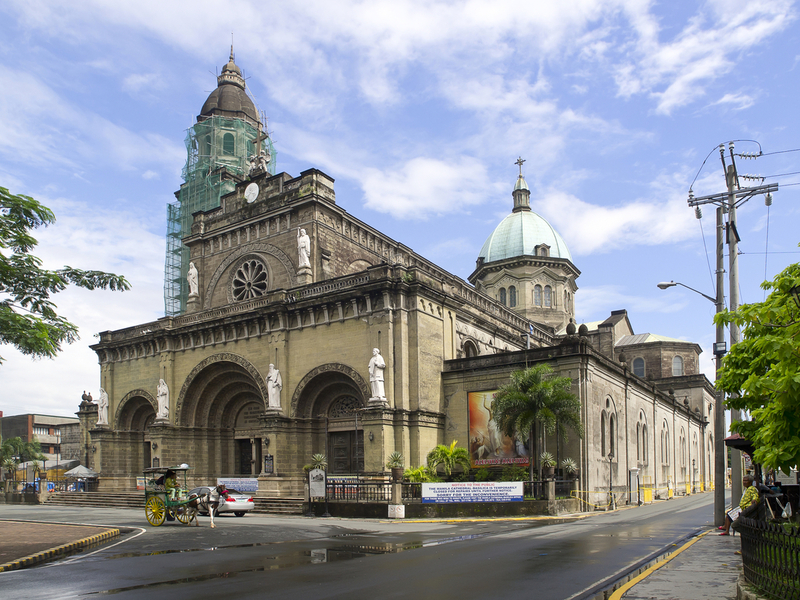 The tour then proceeds past the Manila Cathedral, a magnificent feat with its intricate stone carving, stained glass mosaics and rosette windows. In addition we will also visit Barrio San Luis: a complex of reconstructed period houses depicting the Filipino life styles of the 19th century. Then walk across the street to the Casa Manila, a museum that recreates the lifestyle of the colonial period during the late 19th and early 20th centuries. and the old residence of the Governor-general (President) during the Spanish era–which is now the head office of Land Bank of the Philippines. This walking tour takes you first through Fort Santiago. Originally built in 1571 for Spanish conquistador Miguel Lopez de Legazpi. Fort Santiago or Fuerza de Santiago is the oldest Spanish fortress in the Philippines and one of the major attractions inside Intramuros in capital Manila. The landmark appeared as a pit stop in Amazing Race Asia 2. The tour also includes Bahay Tsinoy and finally, the Chinese Cemetery known for its peculiarity of having grandiose mausoleums with fascinating blend of different religious elements. The return trip takes you down Roxas Boulevard by the fabled Manila Bay. Finally, we take you to the most modern part of the metropolis, Makati - the country's financial and commercial hub, passing through the plush residential village of Forbes Park, dubbed "Millionaire's Row". The next stop is the American Cemetery and Memorial, dedicated to the 17,000-plus soldiers of World War II who lost their lives fighting in the Pacific. lunch ,entrance fees and a guide.